Environment Minister Amir Peretz slammed the practice of kaparot, saying that it was cruel and unusual. As Jews throughout the world prepare for Yom Kippur, Environment Minister Amir Peretz slammed one of the practices associated with the holy day – kaparot, in which a chicken is used as a “stand-in” for an individual and is slaughtered in lieu of a human being as punishment for sins. The meat is then usually handed out to the poor. According to Peretz, the practice is cruel and should be banned. Kaparot, he said, qualifies as one of those practices. “Tens of thousands of chickens are forced to suffer unnecessarily, stuck for hours in the hot sun in tight cages, and then waved over the heads of people. At the end of the ceremony the chickens are slaughtered,” often in an unkosher manner, he added. 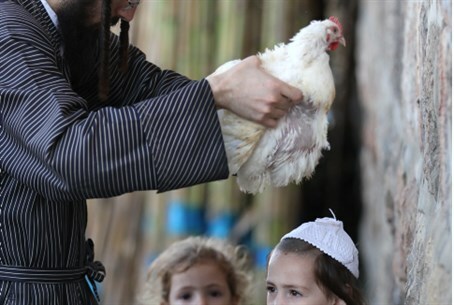 Last week, Agudath Israel of America, the umbrella group for many Orthodox and ultra-Orthodox synagogues and schools in the US, reissued a notice (kol koreh) that was first published seven years ago warning those using actual chickens for the kaparos ritual to ensure that the procedure and process takes place under strict rabbinical supervision. “We have enlisted the assistance of a group of distinguished local Rabbis to work together with the proprietors and sponsors of Kaporos centers and with kashruth supervisors to implement proper standards, and to oversee the centers to ensure that nothing improper transpires in the Kaporos process,” the notice adds. The Kaparot custom dates back to the Middle Ages and was even controversial back then - with some major rabbinic figures criticizing the use of live animals as unnecessarily cruel, and even "pagan".